If you want to know renewal information, please see the "What's New" page. All records are collected by Masanori Yokono from 2000 to 2010. Information Only, Not for sale. 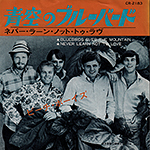 Japanese Singles: "Bluebirds Over The Mountain (CR-2183)" was added. --> go to "What's New"